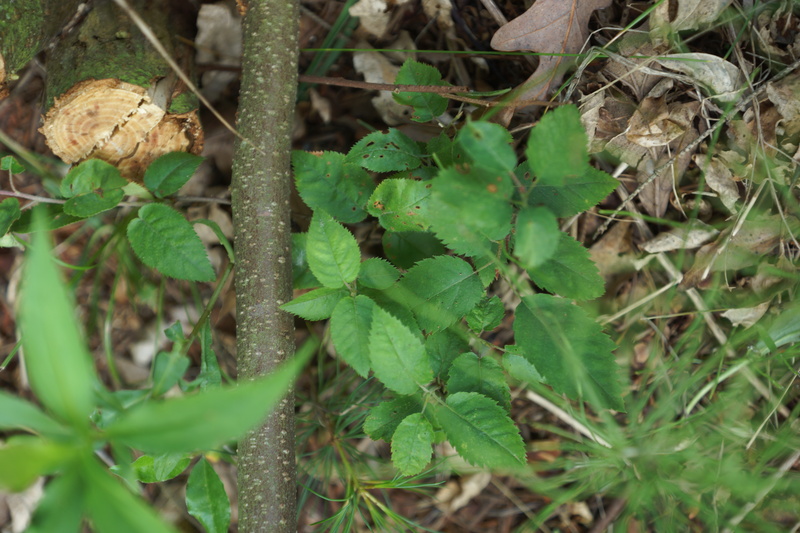 One of the great nitrogen fixers, autumn olive with its delicious healthy fruits creates a soil condition perfect for natural regeneration of serviceberry. Beneath the plants is a perfect nursery soil for bird dispersed seeds of this plant. To speed the growth of the serviceberry, prune back the autumn olive shrubs in mid- summer and again in early spring of the next year. Keep the branches crushed and near the base of the desired plant. This is your fertilizer. Serviceberry and pawpaw grow well with autumn olive. 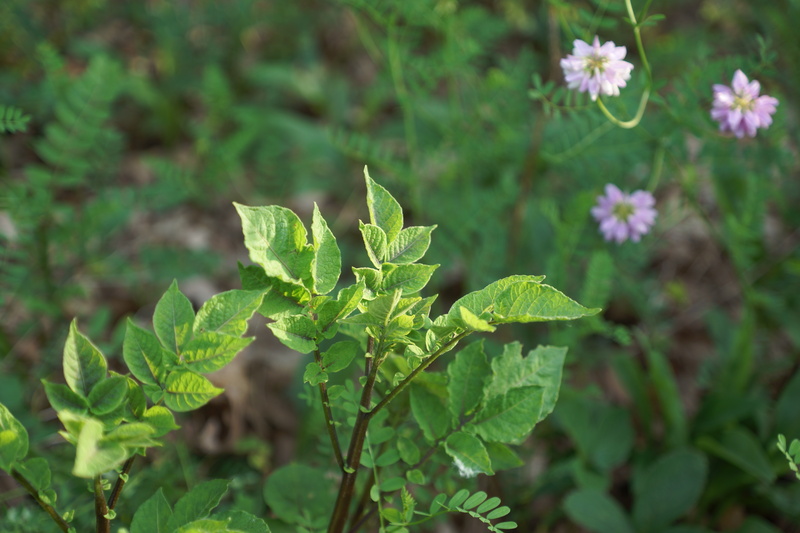 These two species represent two compatible perennial vegetables that provide both greens and tubers in one planting. 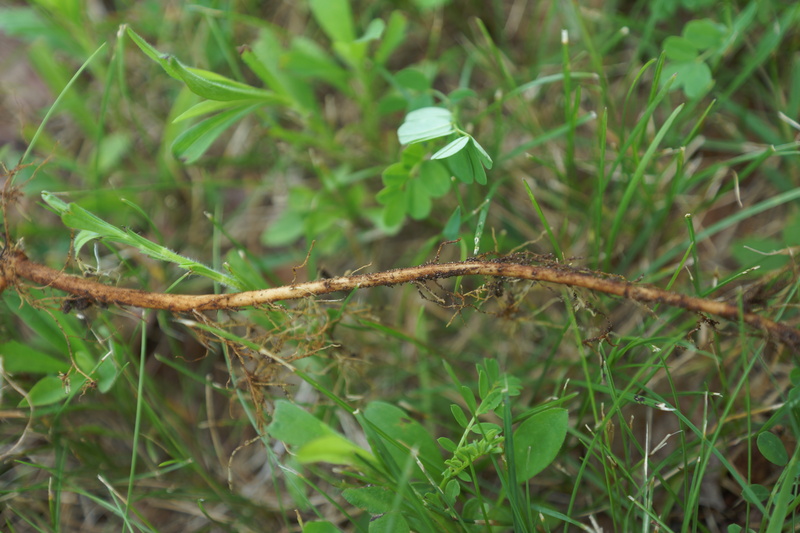 The tubers of earth pea are produced all along the base next to the thick rootstock of asparagus-both which have radically different root profiles. (A key to this ‘opposite attracts’ companionship.) The asparagus provides a perfect trellis system for the pea and the pea simultaneously fixes nitrogen for the asparagus. 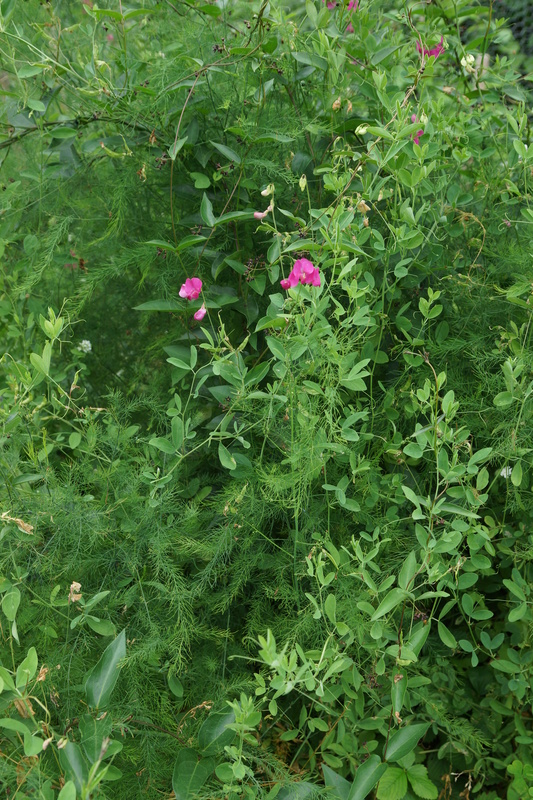 The asparagus ripens long before the earth pea becomes dominant. Peas are produced in greater abundance with this natural trellis system perfect for harvesting seeds to make more plants. 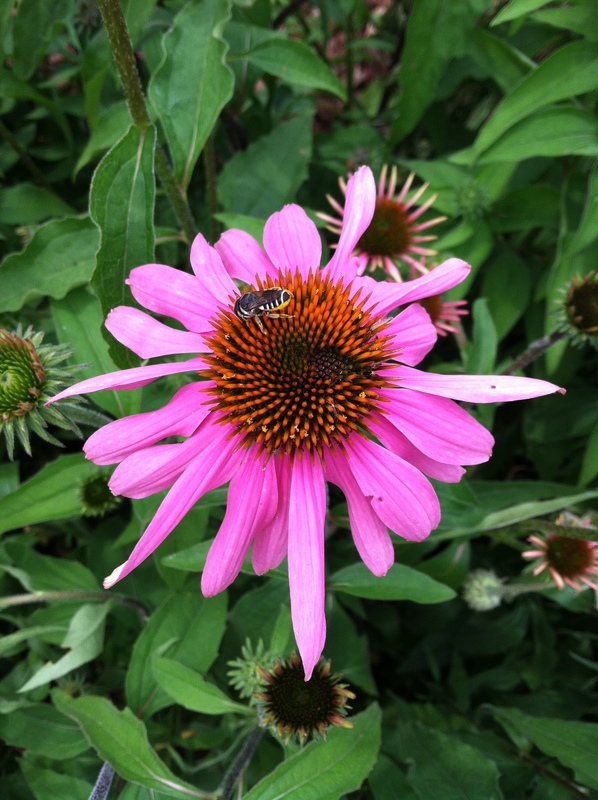 Busy as bees on a coneflower! How busy we have been this year– from working on our barn, to beefing our catalog of plants, to managing a busy planting and shipping season. We have literally been running around like the turkeys who frequent our fields! With all of the new changes, it became obvious not only did we need a forum to let our fans and customers know what has been and will be going on (this blog), but we needed a new, user-friendly website for the business. The new website found at http://www.oikostreecrops.com/ features a more organized way of browsing our store with easier access to all information, including plant descriptions, sizes and pricing. More and better images allow you to see features of the plants you are purchasing like never before. In addition, featured articles on our homepage allow you to learn more details about our unique plants and ways of cultivating them. We encourage you to check out the new website and let us know what you think! Happy browsing (and planting)! It was only by accident that I found an American chestnut tree one summer while doing yard work for a little extra money in my senior year in college. The dried burrs I found beneath it made a great ornament on my desk. “Look but do not touch” it said. I read as much as I could find about the tree. Yet the history of the tree and its dilemma with disease were of little concern to me. I thought I was just lucky to find a single tree because Michigan is not its home base. It wasn’t even mentioned in my botany courses. When I started my nursery a few years later, I found out that a number of nut growers had produced hybrid progeny that would at least repel the dreaded blight. Some said immune, some said resistant and others said good luck. Being young and stupid has its advantages as once again, I ignored the warnings and went ahead with my plans. With check book in hand, I purchased as much seed as I could buy. Prior to ye ole internetti, I made a lot of phone calls and letters. Eventually I set out numerous seedlings on my farm and sold many thousands of hybrid chestnuts in my nursery. Within 6 years my orchard was bearing and I began enjoying my own seed source. This was encouraging and reinforced my go it alone approach. Oh the nuts were delicious. The trees were magnificent. Some of the trees grew 6 ft. in a single year. Others had 8 nuts per burr with some young trees producing in 2 years from seed. It was somewhere around the 15th year that chestnut blight finally ended up in my orchard. It was not pretty. My guess was that it probably blew in from a tree far away. I had never brought in seedlings, scions or wood of any type to risk infection. One afternoon while cutting some trees down someone came up to me and said, “Aren’t you sad you had to loose these trees after all those years?” Well..not really. There certainly was a loss but the gain for me and my planting far overshadows this. A plant world without disease, insects or any powerful force of nature would be a world without progress or change. To overcome these obstacles, you have to start with the seed and preferably from the seed of the most recent generation. The simple act of planting a seed can only give this result time after time. Going to grafting or cultivar selection only arrests that process. Thank goodness I did not have a grafted hybrid orchard as all the trees would be dead! Now that I appear to be a little wiser (the verdict is still out), I am replanting with a greater diversity than I did before plus using the many naturally regenerated seedlings that grow around my parent plants that have no blight and leaving them in a greater density than before. Anticipation is a joyous state of mind. As I look over that beautiful lumber, I am not thinking death but rebirth as to what new life I can bring to this wood. A table, guitar or a chest of drawers made from the trees I grew on a whim given to family members would be a way to say thank you to the trees that constantly give life even after death. Nothing is lost.